Ok, first I had to show you this picture! 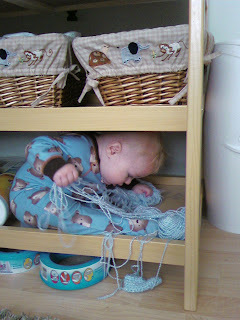 Silly baby Gray climbed up on the bottom shelf of his changing table (all hunched up, as you can see), and proceeded to unravel a whole skein of yarn I had down there! Guess I will be moving things off that bottom shelf! Rookie mistake! :) What a stinker! Ok, now onto the tag -- thanks, Jess! 1. not pick my baby up when he's crying. I just can't do it! 2. write in a straight line on a blank page. it has to have lines on it for me to write straight. 3. play video games -- I'm really really bad at them! 5. stay mad at Grayson, Ollie or Steve for more than a few seconds. they're just too darn cute! 1. No, no, no, no, Grayson! 2. Oh my goodness, you're the cutest baby ever! 3. Don't put that in your mouth! 4. Momma's exhausted, Gray! Please go to sleep! 6. What a big boy! 7 People I tag: Sarah, Bex, Hannah, Harmony, Kasey, Katie, Cassi, and my momma! I'm glad that I'm not the only one who can't keep their house clean. I try really but every time I turn around there is another mess. You've gotta love those 48 hour days. The joys of night shift!! I love the picture of Gray all squished on the bottom shelf of his changing table. I don't think you are suppose to NOT pick up the baby if he is crying are you ? and can anyone keep the house clean when they stay up 48 hours straight ? I think not - - well unless that is WHY you stayed up ! silly mantha ! I LOVE THE Picture of Gray - he is just like his pretzel daddy ! LOVE YOU - - and my house wasn't clean when you all were babies either ! Thanks for tagging me. I actually already did this one just today! And I am the same way when it comes to writing on a blank paper. Things I cannot do - talk(my crappy voice!) sing any more, hate, get enough of Grayson, run, get over all my children and creatures being GONE - the whole empty nest syndrome!, and do the splits any more! I really love that picture, he's such a cutie!